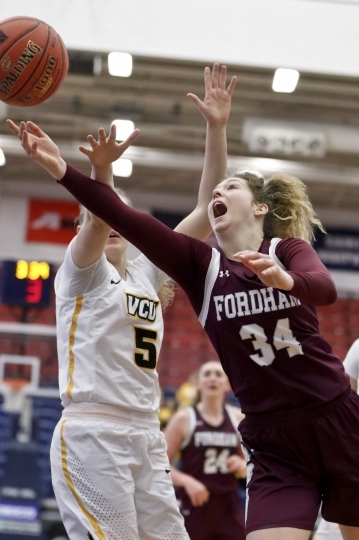 NEW YORK — Mary Goulding is a big reason why Fordham is back in the NCAA Tournament for the first time in five years. The senior forward from New Zealand admits that the New York school wasn't on her radar until after her freshman year at a junior college in Wyoming. Now she can't think of anywhere else she would have rather spent the last three years of her college career. "I never even heard of Fordham," she said laughing. "I didn't even know where New York was. I didn't know Fordham was in New York." Goulding is averaging 12.9 points and 8.3 rebounds for the Rams, won the Atlantic-10 regular season title for the first time in school history. "I'm super excited. This group of girls is amazing," Goulding said. "We've worked so hard in the preseason and in season. We really deserve it and so happy our hard-work has paid off." Coach Stephanie Gaitley is no stranger to having players from New Zealand on her team. The last time the Rams made the NCAAs in 2014 they were led by another Kiwi — Erin Rooney. 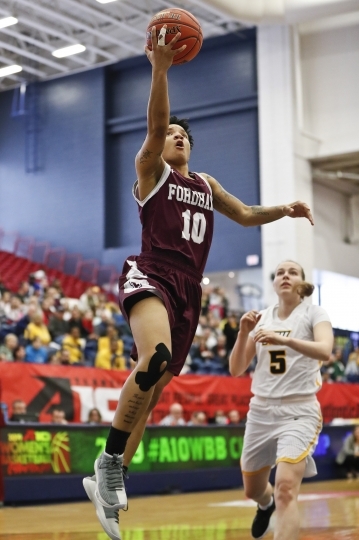 Goulding didn't know the Fordham great until she was being recruited by the team. "I've heard of her now, she played soccer, which we call football back home, against my sister and played basketball at a rival college to where my sister went to," Goulding recalled. "My sister knew her. ... I reached out to (Rooney) and she was really helpful. I asked her questions about Fordham and she gave me essays for answers." Goulding has been the linchpin for the Rams and Bre Cavanaugh has been the offensive go-to player, averaging 17.3 points. The pair, who earned first team all-conference honors, hope they can help the Rams to the first NCAA win in school history. The team lost a tough opening round game to Cal in 2014. "I think we did the right things in that game. It took a really good individual performance from the point guard at Cal, to get them over the hump," Gaitley recalled of the one-point loss. The Rams have had quite the turnaround in Gaitley's eight years at the school, going from a team that had few winning seasons to one that has had three straight with 20 or more victories. The Rams have had six in her time as head coach. 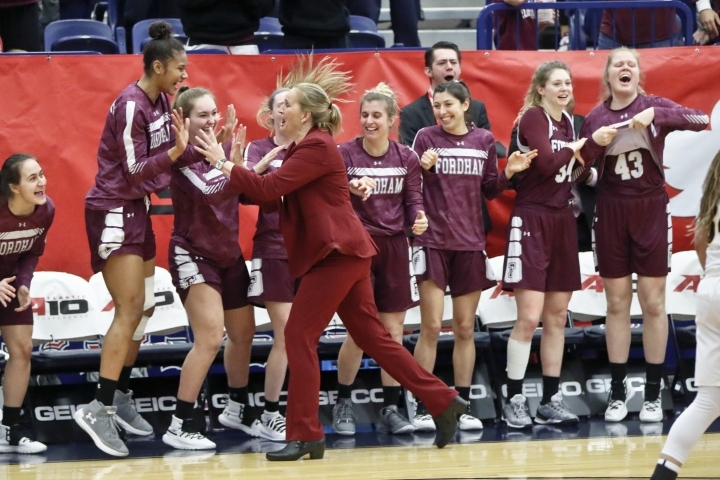 Fordham (25-8) has matched the school record with 12 consecutive victories and easily won the conference tournament, averaging 23-point wins. "It's very rewarding with this group since the chemistry has been the best it's been since I've been here," Gaitley said. "They generally care about each other." The Rams have had a few days to enjoy reaching the NCAA Tournament. They were honored in Brooklyn during the men's Atlantic-10 Tournament game between Fordham and Richmond, where Gaitley's son plays. "It worked out perfectly. 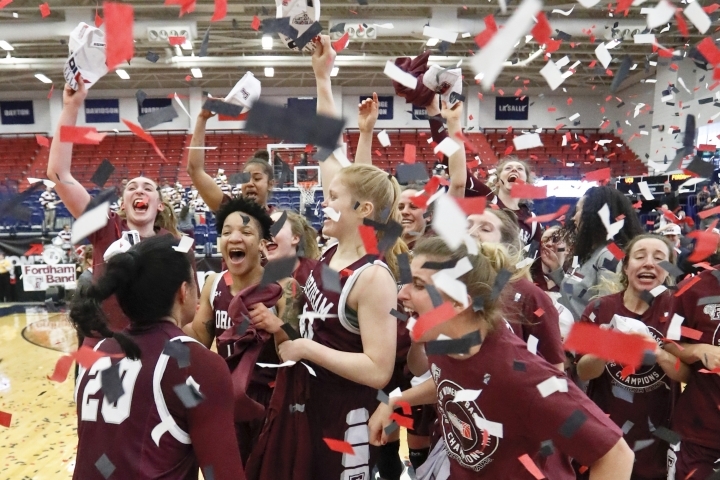 We got to enjoy that moment with our band and cheerleaders and the Fordham community was excellent," Gaitley said of the tribute. The coach doesn't know where her team will be placed in the bracket, but just hopes they have a chance. "You need a little luck of the draw. I hope we don't get stuck playing the home seed first," she said. "You got to be prepared. A lot is preparation, but a lot is believing. We're not just happy to be here. Fordham's never won a first round game, that's our goal."